MUSIKMESSE 2015: Roland's Aira synths, beatbox and more are their retro-modern look back at their golden age of hardware. And the line-up seems set to get larger and more retro than ever thanks to some teased images released in advance of the Frankfurt MusikMesse show on April 15th. The tantalising image in question looks very much like the Aira System-1 interface and four smaller units, with the tagline "Start Patching" strongly suggesting that Aira is going modular as of next week. 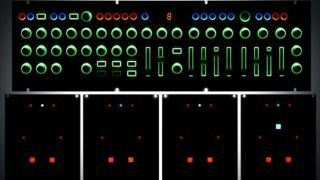 Currently the Aira range sports the TR-8 drum machine (accurately recreating the classic 808, 909 and - via an expansion - 707 and 727), the TB-3 bass synth (a fresh digital take on the 303 Bassline), and the System 1 synth (offering innovative 'plug-outs' that emulate their SH-101 and ProMars synths). Also along for the ride are the VT-3 voice transformer (a super Boss VT-1) and latest addition the MX-1 performance mixer which plugs all your Airas together under one control surface. New 'plug-outs' (emulating classic Roland synths) have been slow to emerge for the System 1 and the new teaser would appear to show that Roland are expanding in a totally new synth direction. Their System 100 modular synth - introduced in 1975 set the scene for a synth made of expandable parts and the System 100m from 1979 gained greater exposure and expanded the blown-apart modular concept further. Even from the shadowy outlines in the latest leak it's clear to see a System 100 influence in these new Airas. Alternatively System 100m offered 20 different modules in total, adding ring modulators, voltage controlled filters, dual voltage controlled oscillators, amps, LFOs, envelopes and more to the basic single oscillator VCO, VCA, VCF M-110 main unit. Could these four boxes offer similar powers? And will they be genuine analogue (in the wake of the JD-Xi and upcoming JD-Xa keyboards) or digital recreations as per the rest of the Aira range?